Capture from animation for ‘The Rite of Spring’. Photograph: Courtesy of Stephen Malinowski. I was sent a link to this pair of videos over Twitter that form part of the umpteen celebrations of the 150th anniversary of the first performance of Igor Stravinsky’s world-changing ballet, The Rite of Spring. 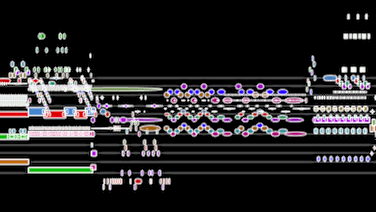 Here animator Stephen Malinowski and music synthesist Jay Bacal team up to create a scrolling visual representation, in two parts, of the original score. Don’t be put off by how the animation looks. Despite looking a little like it has been drawn using Microsoft Paint Malinowski’s simple visuals, using a programme he himself invented, leave space for an incredibly insightful analysis of both pitch and timbre. Each shape and its size demonstrates a type of sound: oval for warmth, oblong for sharp and star for staccato. What’s more Malinowski manages to animate each sound’s resonance by means of fading colour within the shape. The result is an in-depth and comprehensive dissection of the great work that is easy to interpret. When you watch the animation you find Malinowski’s theory of eyes leading ears is bang on the money. You very quickly find yourself far more focused on the nuances of Stravinsky’s scoring rather than if you just sat down and purely listened to it. All of a sudden, even for seasoned aficionados of the piece, you’re opened up to a deeper understanding of the piece’s complexity and genius, provoking a new-found appreciation for the work. For his other animations Malinowski has been using royalty free recordings, so teaming up with a synthesist is a bold step. Bacal’s music is for the most part incredibly impressive. A lot of the time you really are fooled into thinking you’re hearing an actual symphony orchestra. Unfortuantely, there are still more than a few tell-tale discrepancies that rob it of its convincingness, especially solo cello and trumpet sounds. It’s a stark reminder that despite the fact we’ve come an astoundingly long way since the days of .midi, we’ve still not quite managed to prefect sound reproduction; but Bacal demonstrates we’re certainly very close. The other fault with the music is one that though managing to do a good job of handling dynamic it’s still quite flat in comparison to professional recordings that capture the vulgarity, passion, and aggression of the piece; it just can’t match an actual live performance. It lacks the personality of a conductor’s interpretation in this very by-the-book reproduction. Therefore, despite the insight the visuals offer it’s aurally quite unsatisfying, especially for Stravinsky fanatics. Overall, this is definitely worth a watch as it offers a straight-forward and accessible academic diversion. But for all the other recordings that YouTube has to offer, once you’ve seen this you’ll be going back to listening/watching your preferred performance, albeit a little more informed than before.